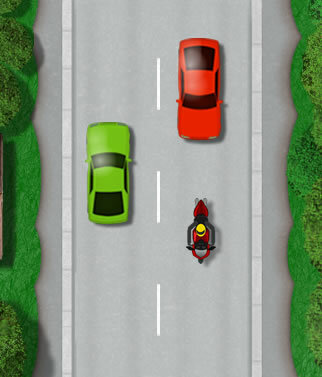 Motorcycle lane discipline is termed as the ability of the biker to correctly follow lane markings and to position yourself in good time so to enter the correct lane. With increasing traffic, comes more complex road systems, often resulting in a greater amount of lanes at junctions and roundabouts. Many of these traffic systems have lane markings which help to guide traffic to the appropriate direction / destination and to aid in traffic flow. Good lane discipline starts with looking ahead at signs and road markings to gain the appropriate road position for entering the correct lane. Good lane discipline helps to avoid accidents. 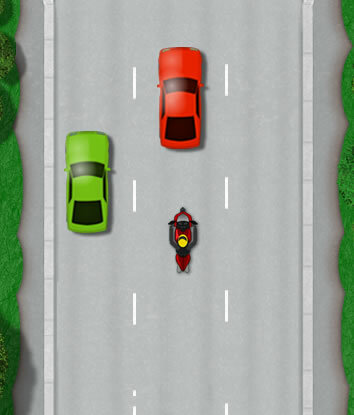 Weaving from lane to lane is hazardous as it doesn’t provide other road users the ability to see you and anticipate your actions. In terms of the motorcycle riding test, it’s not designed to test your ability at navigation, so if you find yourself in the wrong lane, move to the correct lane only if it’s legal and safe to do so. Ensure there’s enough time for the manoeuvre, ensure you check your mirrors, over-the-shoulder blind spot check and signal. If you cannot do this, stay in the incorrect lane and the examiner will re-route you further down the road. Wider roads where traffic is flowing in the same direction may be separated into lanes by broken white lines called dividers. Lane dividers are usually short broken lines painted on the road to keep traffic in their specific lane, often at the approach to junctions and roundabouts, often then followed by hazard warning lines (see below). It is advised to stay in lane though it is legal to change lanes if necessarily. In locations that are particularly hazardous, lanes may be occasionally divided by continuous solid white lines. It is illegal to cross or straddle solid white lines. The meaning behind the lines painted in the centre of our roads can often be ignored or simply not understood. 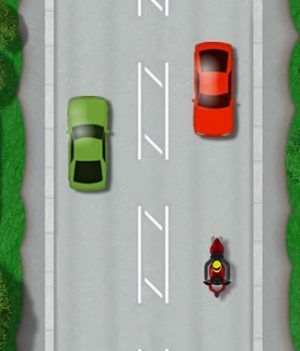 An important aspect of lane discipline is to understand road markings and lines, so to follow the appropriate and correct route. Here’s an example of centre lines and their meanings. The centre dashed line simply marks the centre of the carriageway and can be crossed providing it is safe to so. Short dashed line with long spaces indicated lane dividers. These are used to divide lanes flowing in the same direction. After lane line whilst approaching and nearing a junction, you’ll often encounter hazard warning lines. Hazard warning lines have much longer strokes than lane lines. Diagonal stripes or hatched road markings are used to separate traffic lanes and to protect traffic that’s turning right. It is advised that you do not enter these areas, though if the hatched markings are surrounded by a broken line, you may do so. If surrounded by a solid continuous line, you must not enter this area unless in a emergency. Where a solid white line is located nearest to you, it will be an offence to cross or straddle the line except under certain conditions. You may cross a solid white line to enter adjoining premises or a side road, to pass a stationary vehicle, or overtake a pedal cycle, horse or road maintenance vehicle, if they are travelling at 10 mph (16 km/h) or less.